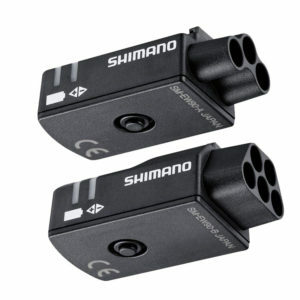 I have Shimano Di2 Systems on two road bikes. 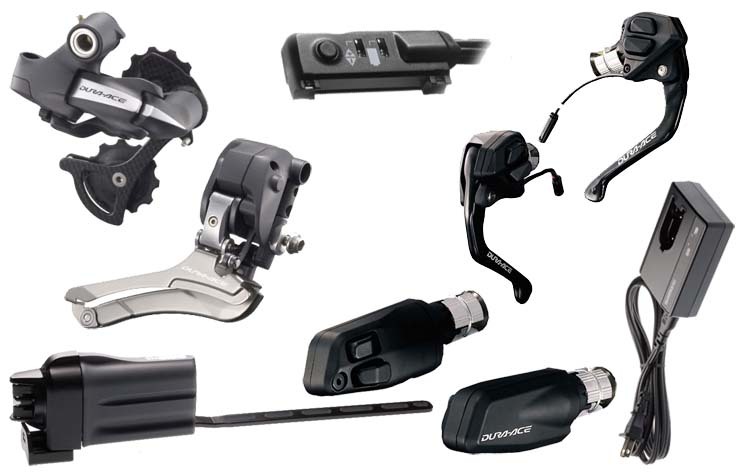 dura ace 9070RD/FD Levers R785-r-l battery BTDN110 and controller SM-E90-A and the other Ultegra 6870 RD/FD levers 6770R-L Battery BT DN110 and controller SM EW90-A. I have the latest e-Tube software. I setup autoshift using e-Tube on a PC and semi auto as well but I can not figure out how to activate autoshifting or whether I am still missing something? I press the SM-E90A twice to activate? but that doesn’t seem to work. I have the latest firmware on both systems — can you let me know what I am doing wrong? 52/36 chain ring, standard setup for the shift pattern loaded in the software. I’ve got it. Changing shift mode needs 2 very very quick blips on the switch. I’ve been doing it slowly. Also, simply holding any of the lever switches for about 1 sec gives battery status and shift mode. Great site! I have a Cervelo S5 with standard Horn bars, 6780 shifter, aero bars and bar end shifters. I am using a SM-EW90 5 port junction box. I use the bike for long time trials, 12/24 hr. and want to change to regular aero bars. 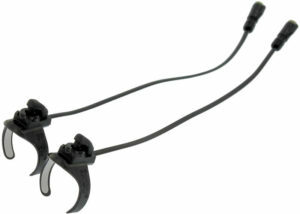 I have a pair of ST-6871 11s shifters I will use on the base bar and will use the same aero bars and bar end shifters. 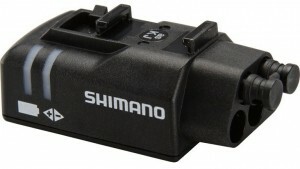 I want to know if the TT shifters will be compatible with the junction box I have or I need another one. 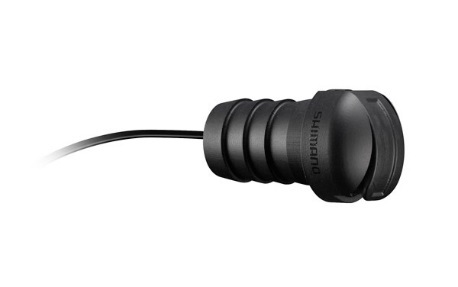 Shifters cam with cables and the end plugs look like the same. I am also building a Dogma F10 as a “climbing bike”. My intention is to use the 6870 brake/shifters on that bike (along with the horn bars off of the S5. 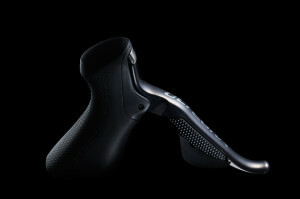 I want a new Di2 system for the F10 that will be compatible with the “old” shifters. Will probably also install aero bars and bar end shifters Both new) as well (similar to what I have currently on the S5.) DO I go with a 2nd gen. system or the newer e-Tube system. All of the e-tube shifters are compatible. It’s really a matter of personal preference and cost. The BTR2 will not work, you need a DT‑DN110 contains a new memory chip that is both Bluetooth and ANT+ capable. Thanks – actually the battery is internally mounted and the junction box A is a 3 port SM EW90. The other reply seems to suggest I need a different battery? Ok sorry I assumed wrong. The part number of what you said above is for the old style Ant+ only model ( I also have two of them on my Di2 bikes and they work fine, one has internal battery and the other external). I assume that you have already doine this but I will say it anyway….With what you have just said do you have the internal battery charger with the usb that you connect to a PC/laptop? if so have you downloaded the etube software? if so then plug your cable into the A port and let the software recognise your system and do its connection check. On the screen the items will show up on the graphic. then go back to the main screen and you will see a button for firmware update, press that and the system will update the firmware to the latest. 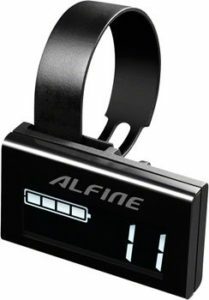 Once done get your garmin to look for the ant+ unit for which you may need to set bike up on a stand and change gears a bit till it “kicks” system into action. All being well it should then show the gear page and you will be a happy bunny. Thanks again – becoming clearer – yes I have a charger (SM BCR2) and the USB port/cable but my laptop is an Apple (without Windows) so I’ve not managed to download the E-tube software and make that apparently critical step (hence my attempts through the E-Tube App on my iPad). I guess I’m going to have to find a friendly lbs with a PC who can do the firmware upgrades for me. Still not sure whether I need a different battery? Carlton thanks for this extremely informative site. So far it has answered all of my questions. So much so, I am about to order the new 2018 Ultegra Di2 upgrade kit. I’ll need to use a 5 port junction port so I can later add the E-Tube bar-end plug. My only worry is getting the cable from the RD thro the chainstay and past the BB. I currently have an internal RD mech cable but it is very thin. I might have a dummy run with some electrical cable to see if it goes thro. Anyone know what this adjuster does on the Di2 mech? I have not had a play with it, but wonder if it either takes out any slack in the linkage, or perhaps allows a mechanical “trim” of the mech position (as opposed to the +/- 15 electronic clicks). 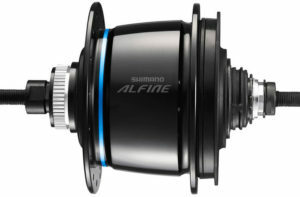 I cannot see any reference to it in the Shimano techdoc. Could I pick your brains please? I finally connected the Ew-wu101 today. I have the correct BT internal battery. There were 5 updates needed through the app on my iPhone. I did the 1st 4, but the app crashed @ 48% on the 5th update – the internal battery. Now the whole system is dead. The battery won’t charge. I have the SM-PCE1 box. It won’t recognise the system as it is. If I disconnect the internal battery it recognises everything else (but says the system needs a battery to operate). If I connect the battery directly it is not recognised. Any ideas? It looks like I have to get the battery updated to move forward, but I can’t get anything to recognise it. Managed to get this fixed. I had to connect the battery directly to the SM-PCE1, then overwrite the firmware by selecting the cable symbol on the right hand side of the e-tube login screen. All updated & all back working again now (Apparently if after 3 attempts the Battery is not recognised, you can tell the SM-PCE1 what it is and that should fix it, although mine worked 1st time). Hope this saves someone a lot of mucking around down the line (as long as you have access to the SM-PCE1). I have the required hardware for synchro shift and all firmware is up to date. I’ve been using it (and loving it) for several months now. I recently had to disconnect the battery as I removed the seat post. Whilst I was at it I disconnected and reconnected a couple wires for a better cable run. Now its all back together and I can’t get synchro shift to work. The button on junction box A still works (to set into bluetooth mode or adjust mech trim), but double clicking does not change between shifting modes. Its basically stuck in mode 1 (traditional shifting) which is working fine on both derailleurs, but I can’t get it to change into modes 2 or 3. I’d be very grateful if you could come up with a suggestion as to what I have done and how it can be fixed. The double click needs to be fast. About ready to make the jump to electronic shifting, have an F10 frame here which has the removable cap, which -as I understand it- is replaced by a combination charge connector and junction box all-in-one, referred to as an ‘E-link’ port(?). The bike has been a build project for my son to learn about how things go together, get adjusted, why torque wrenches are important and how to use/store one, etc. 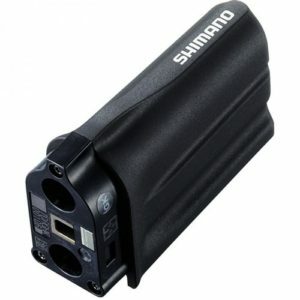 I’m trying to plan out everything I’ll need, but I’m a little confused about which battery, how it mounts in the downtube, and whether I still need an A-junction, etc. Hunted online for an everything you need to know’ to answer my question, and this seems to be a great resource. The shifters, FD and RD seem straightforward, and I’ll need cables to connect to those, but it all seems a little vague and mysterious inside the frame. Thanks in advance for any illumination! Sorry for the delay. The “E-link port” you describe is the Junction A, so that will work fine. I like how well those integrate! Thanks for the reply. I took my time, sourced the parts (including the Pinarello-specific seat-tube battery mount) and installed everything last weekend. I ‘roughed-in’ the adjustments on the frame, then trimmed everything on a shakedown ride midweek. I bench-tested the setup before changing anything on the bike; that reassured me that I hadn’t overlooked anything that I’d need. Only difficulty I struggled with during the installation was getting the E-tube cable through the chain stay; there was some internal restriction near the rear dropout, and I couldn’t feed the connector through in either direction. -Solution was to cut one connector off about 3″ from the end, and splice the two pieces back together close to the BB. Once that was all done, it really was ‘Plug & Play’. 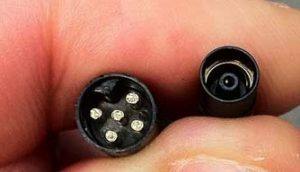 Since the connectors are coaxial, I had expected to find the cable was also coaxial, but was surprised to see that it’s a standard bifilar cable, with red and black insulation around the two conductors. The overall jacket material seems like a synthetic rubber, which resists wire strippers somewhat, while the conductor insulation molded inside seems like PVC or similar. -If anyone else ever has to “cut, feed, and re-splice” here’s what I learned: The jacket is most easily removed -carefully- with a single-sided razor blade. I found it best to ‘draw’ the blade edge around the circumference of the jacket, while SLOWLY turning the jacket the other way. -Don’t go so far in that you ‘nick’ the conductor insulation. If necessary, use an over-length E-tube cable so that you’ve got a little extra length to trim back if you need to take 2 or 3 tries before you get the perfect job done. initial riding impressions are a real delight! 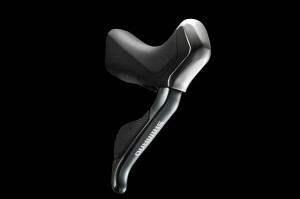 -More than a gimmick or a simple convenience, the Di2 really does make shifting a more ‘precise’ experience. -So much so that I’m now looking at sourcing componentry to upgrade my son’s 6800-equipped bike to 6870 Di2! Thanks for the excellent resource! Can I use just the climbing/pave shifter SW-R600 for rear-only shifting with non-electronic levers (Campag)? For a new custom gravel build, I’ve learnt from this site (thanks, Carlton) I’ll need to purchase bar-end junction, Junction B, internal battery (& charger), rear der, assoc cables. Anything else I need? Dan, this looks like a good setup, including the climbing shifters. Thanks Carlton. I was told that you needed both sides to work. As a matter of curiosity are the brains in the derailleurs ie the levers/shifters send the signals to the derailleurs and the junctions are just connection facilities? Dan, the system is somewhat decentralized, but the battery is what does the coordination of connected components. 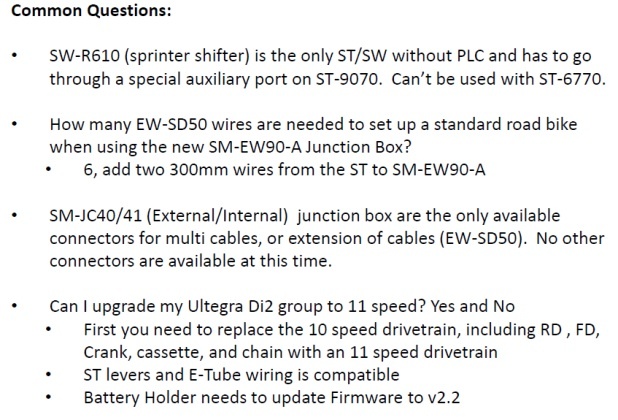 Carlton, probably can file under ” another stupid question”…I bought the SW-R9150 shifter set. Each sifter comes in a separate bag, one pink, one clear with corresponding different part numbers. Is there any difference, like a left and right, or does it matter. Can’t believe the instruction sheet is so sparse! I think I found the answer…on each shifter there is a small “R” and “L”, so I’m presuming that would be left & right, also the pink bag has the “R” shifter in it. I’m going with that. 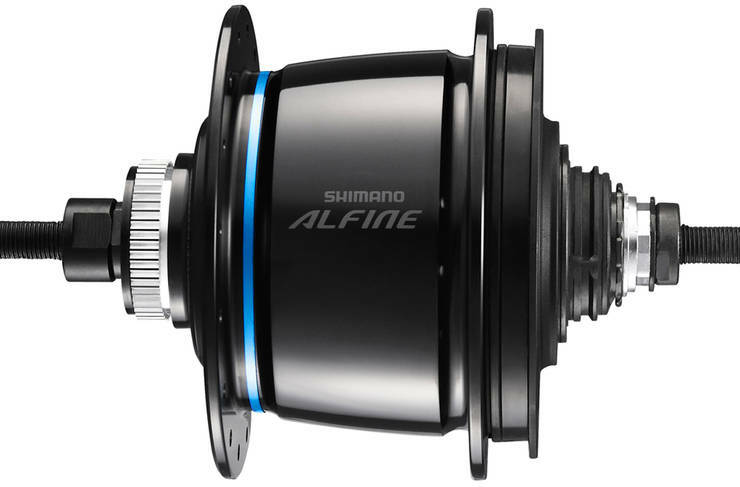 Shimano instructions are notoriously terrible. The L/R labels are what you need. I definitely recommend testing everything electrically before running cables. Basically you have a choice of using your index finger or thumb actuation, but if you try to locate for both finger/thumb then neither works very well. Have you used or installed the R9150 shifters? I know a lot of this is personal preference, but if do you have any insight I’d love to here it! John, I hope you got this figured out. I prefer thumb shifting, but I haven’t tried that with the satellite shift buttons you have. I’d try thumb shifting first. Hey Carlton – thanks for a great page! I’ve just bought a bike equipped with 6770 Di2. I haven’t taken delivery yet but I’m already wondering about tinkering with the system. The chart you and Shimano provide says that the SM-BTR2 battery and the SC-M9050 junction box, which both support synchro shift, are compatible with the rest of the 6770 kit, so is it unreasonable to hope that the 6770 could be persuaded to play along? Is the incompatibility you mention built into the firmware, so that the battery recognises the 6770 RD, for example? Would swapping the RD for a more recent compatible one do the trick? Robin, you would need to upgrade the front and rear derailleurs (and switch your rear wheel to 11-speed) if you want to take advantage of the new shifting options with the new battery. Geoff, the cheapest option is to buy a used rd-7970 on eBay or similar. They are show up once or twice a month. 6870 Di2 has a much better future ahead for support, but you will need to upgrade everything on your bike, including the rear sprockets and maybe even your wheel. I recommend the eBay option and being patient to find the right part. Hi, I´m from Spain, sorry for my level of English. I am a triathlete and I have the new Dura Ace 9150 Di2 in my new Scott Plasma Premium aero TT bike. I´m trying to resolve a big problem for me, when I pedaling in aero position over on the extensions I only can change the gears up with one shifter up and the other down (SW-R9160 Time Trial bar-end shifters (pair) also with ST-9071 Dura-Ace Time Trial/Triathlon Dual Control Brake Levers/Shifters). Synchronized Shifting is a big product, but for us (triathletes) I think that it does not work very well. I need to drop (leave, release) the handlebar of the bike to change gear if I pedaling over the brakes or over the extensions because the all the shifters are configurated with only one button and command. My doubt, is it possible to configurate the shifters to avoid to drop (leave, release) the handlebar or the extensions? i.e., if I control the bike over the brakes and I want to up one gear I need to drop the handlebar to push the upshift. I know that the symchronized Shifting control this situations but for triathlon we need more availability options. i hope that you understand me and help me. Thank yo very much. Best regards. 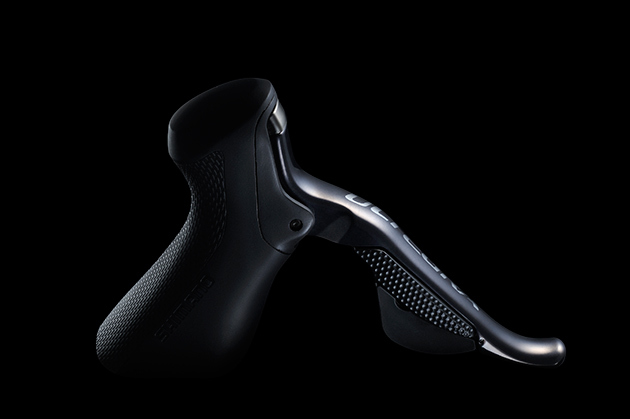 You have 2 options: Use SyncroShift with your existing shifters or replace your 1-button bar-end shifters with 2-button bar-end shifters. I personally use the 2 button shifters. I don’t see any value in having fewer buttons. It’s pretty easy to remember which button does what. Thank you so much for your answer. 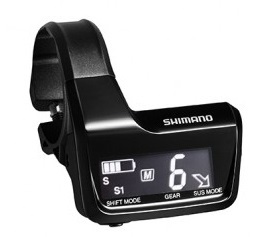 I do not yet understand the reduction of buttons from Shimano. Finally I opted to use the Full Synchro option and left side (handle bar and bar-end buttons) up gear (sprockets) and the right side down, the rest to work efficient is done for the Full Synchro option (up/down chainwheels). The problem here is if you need to up/down quickly the chainwheels you only have the buttons to do it, you can not up/down these one. I saw a neat setup on GCN a few months back where someone with an aero road bike with etap bought an aero tt handlebar and switched between road and tt handlebars only needing to re-pair the shifters (and also change brake cables). I’d like to duplicate this setup with ultegra di2 to save cost, but this would mean changing cables. Seems like this is doable as long as I have the handy cable tool, but I still worry regularly changing cables will wear them down, or wear down the junction box. Would that be an issue? 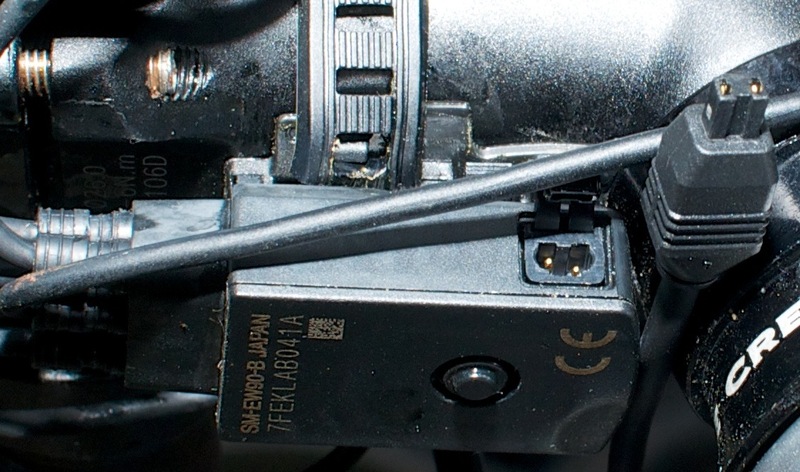 If you’re just changing a few times a year, I don’t think connector wear at the Junction A would be an issue. I agree with you; the only significant difference are weight and price. Unless you are an ultra competitor or have unlimited money to spend, it’s very difficult for me to recommend Dura-ace. 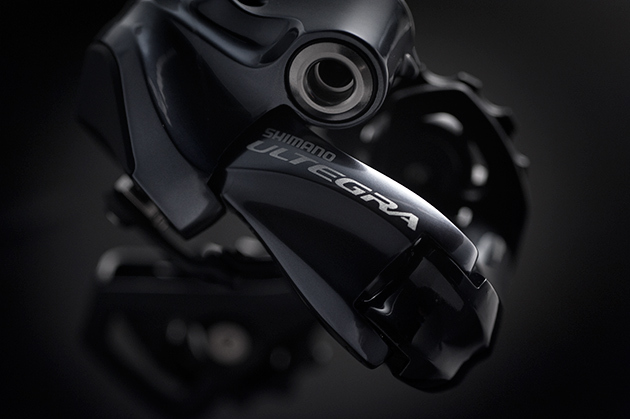 Ultegra offers identical performance at a significantly lower price. 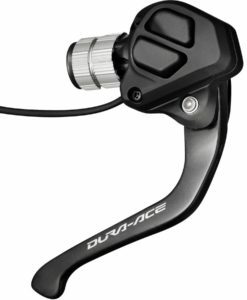 But Dura Ace does have the buttons under the hoods that allow one to scroll thru screens on their bike computer without taking the hands of the bars. Thats a safety feature for me. Does the latest Ultegra have this? To my knowledge, that is Dura-ace only. 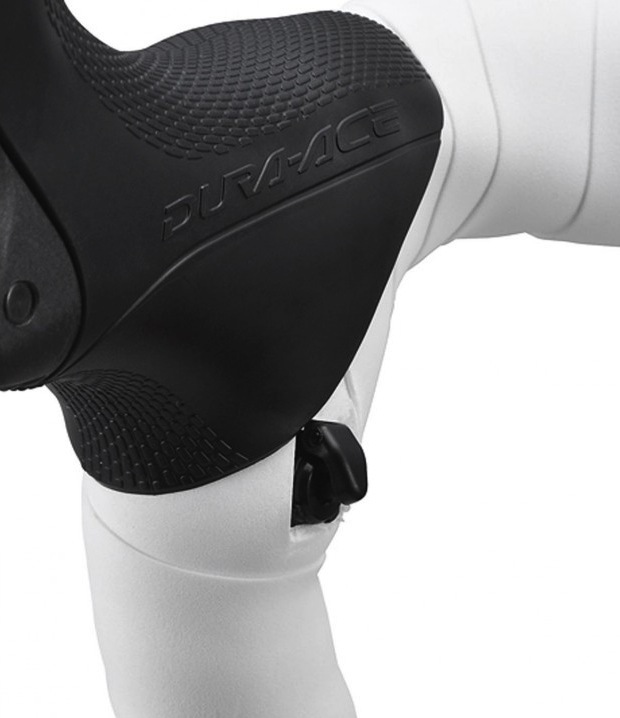 But could use Drua-ace brake/shifters with Ultegra everything else and still spend much less. True that! 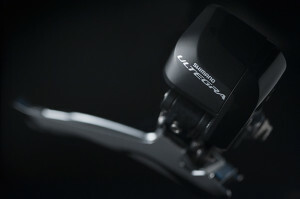 For safety the scroll feature should be added to Ultegra. Adding the DA shifter cost to an Ultegra group is still onerous. Etronics aside, ultegra cassettes are more durable and of course cheaper. I believe the shifters in the latest version of electronic Ultegra – R8050 – do have the same remote switches on top of the hoods as Dura-Ace. However for the next part I’m not really sure, but knowing Shimano, you may need the updated transmitter, WU101 or WU111, and maybe even the most recent battery BT DN110 to fully utilise the remote switches? 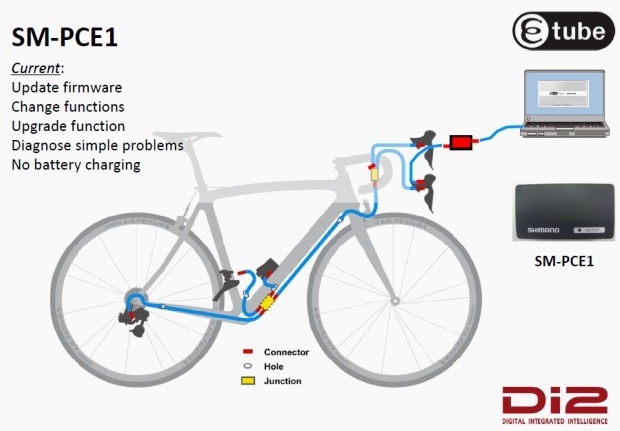 Are the Di2 wires running a 7.4 v voltage or do the battery holder regulate it down? Hello, Carlton. You know how to solve a lot of problems with di2. I think that you can help me to fix problem with di2 rd-9070. Rear derailleur does not shift to 10th and 11th gear. Firmware updated successfully. I tried to fix problem using crash mode. In this mode RD doesn’t shifts to this to gears too… when I connect my di2 to PC RD sets to 9th gear but on PC indicates 11th gear. Carlton could you help to solve this problem? RD wasn’t damaged never. One day it’s stop working correctly. Hello, Carlton. Today I learned shimano manual. Setup procedure did not help. I tried to setup using pc and Etube programm. Programm shows me that I should make a request to Shimano. May be it is mechanical problems? Yes, most likely a failure internal to the derailleur. The dealer setup process would have fixed it otherwise. There is a known battery drain issue with older versions of firmware. Have you updated to the latest version of firmware? yes, i have the SM-PCE1 and the BCR-2. battery is the BT-DN110 and i have the EW-WU101. But have you updated the firmware? Hello Carlton. 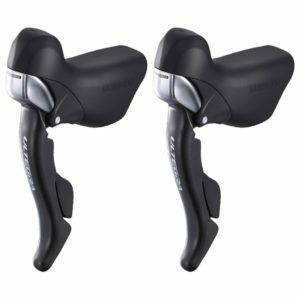 I have a pair of Shimano 7970 shifters,can I use them with Ultegra 6770 front and rear deraillaur? 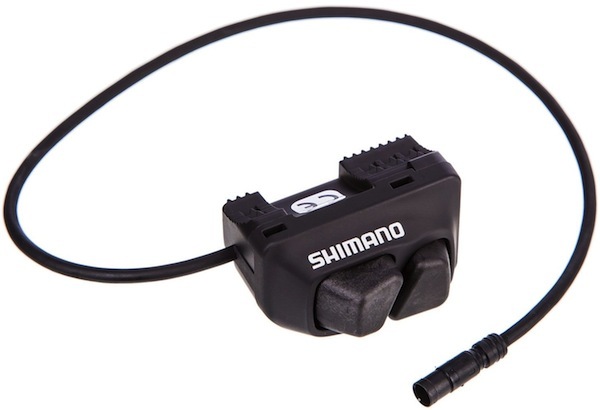 There are a 5-pin Cable after the box from the shifters….And if not,what kind of Cable harness do I need? I have Ultegra 6870 on my CX bike. I want to replace my Ultegra RD-6870 rear derailleur with an XT RD-M8050 derailleur, but I don’t want to replace my Ultegra FD-6870 front derailleur. Will this work? I want to do this because I want to run an 11-40 cassette and a 34-50 chainrings together. I’m currently using a Wolf Tooth RoadLink to do this. 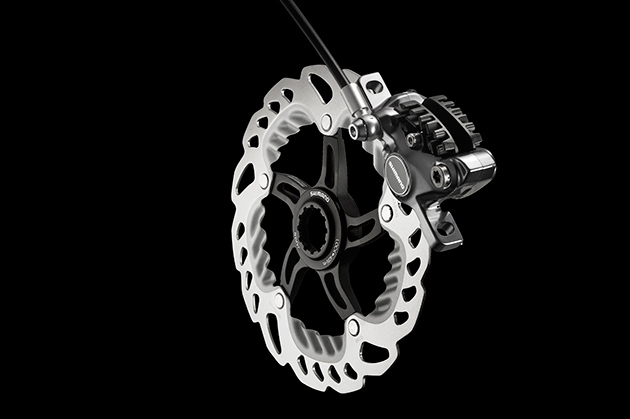 Although this works, I’d prefer to run the XT RD-M8050 derailleur because it has a clutch. This will not work. FD and RD need to be same generation. My bike is three years old with about 19,000kms on it. Since Chistmas, twice when I was out on a ride and the battery indicator was flashing green at the start, after about 45 km, the front derailuer went to the small ring & no more shifting. Indicator was now red solid. The second time this happen, yesterday, it was flashing green for the last month, and three rides, 200km. …My question is, am I looking at a new battery or do I have a abnormally high energy consumption with my derailleurs? Sold green =100-50%, flashing green =50-25% flashing red =25%-dead. All lithium ion power sources drop off sharply after 50%, and more so as they age. Change the battery after you notice is flashing since you don’t know how log it’s been >50%. I have recently converted my shiv tri bike from 6800 (mechanical) ultegra to 6870 (Di2) Ultegra. I have set up both Derailleurs as per the shimano manuals and everything works well. 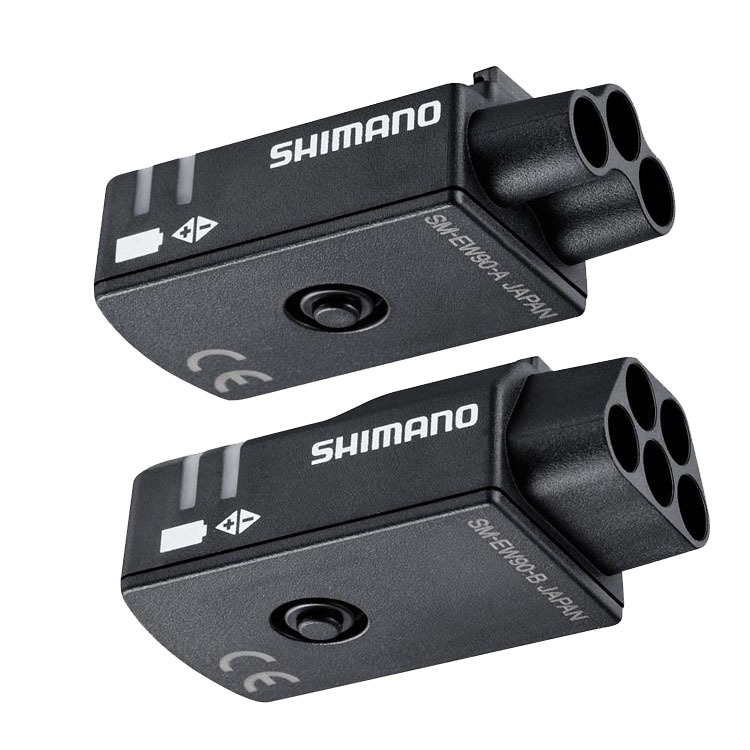 However when setting the “top position electrical adjustment” on the front derailleur I cannot get the specified 0 to 0.5 mm clearance between the chain and the inner guide plate of the front derailleur. The clearance is around 1 mm with the front derailleur fully adjusted over (to the outside) in “adjustment mode”. That is, the front derailleur is at the end of its limit in adjustment mode. The gear changes work perfectly across the whole range so I am being a bit picky in not being able to get the above adjustment “as per the book”. Unless there is a way of getting more range of electrical adjustment then the only way that I can see to get the specified clearance is to physically move the front derailleur mount away from the frame slightly (the derailleur is a braze-on type). 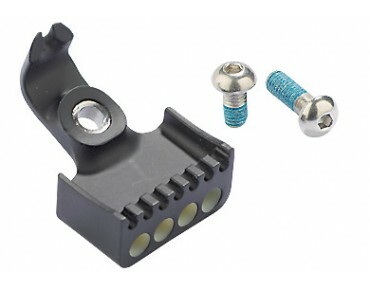 This would mean inserting say a 1 mm shim between the frame and the derailleur mounting bracket. As the mounting plate is riveted to the carbon frame I don’t propose to go to that extent of trouble. Is there an easier way to get this adjustment?? 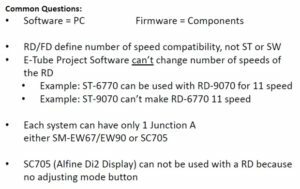 Is it possible to mix XTR di2 fd with road RD-6870 using firmware? All past experience indicates that mixing works. That can change at any time. Let me know if you encounter any issues. Carlton, I came across your website, very good information. My question is, I connected all the components and I get nothing, no lights in the A-Junction box, nothing when holding shift buttons, TT bike bullhorn and bar-end shifters. Battery is charged, pen tested it. Ordering the PC E-Tube testing system but wondering if it’s possible to pintest the cable just to rule them out as the cause or will the E-Tube testing system identify bad cables? One way to check the cables is to plug one cable at a time into the battery and Junction A. You should see the green light illuminate each time you plug into the junction. If no green light it’s a bad cable, bad battery or bad junction. Wow!! Bloody awesome article mate! I have a Di2 6770 10spd bike and thinking about going 11spd and upgrading the firmware to synchro shifting. I have the SM-EW67 Front A junction, and at this point don’t want to upgrade to the EW90. Will the SM-EW67 support sequential shifting? Anything else I need to get this to work? 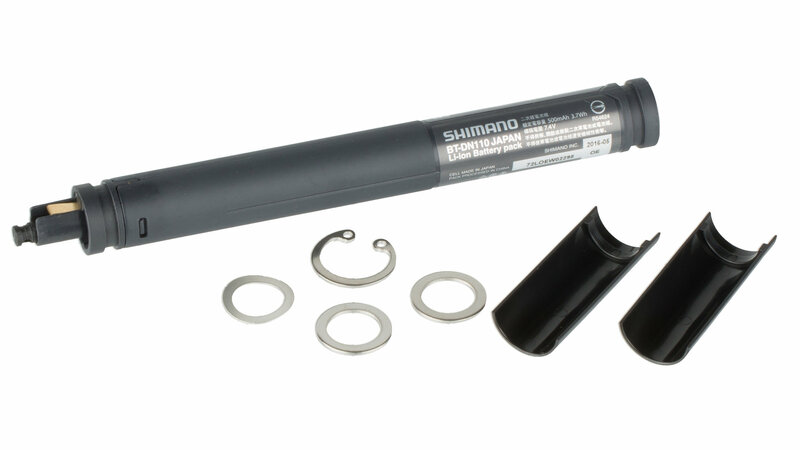 Unfortunately, according to Shimano, the SM-EW67 is not supported by the newer battery firmware required for sequential shifting. So if you want sequential shifting, you’ll need to upgrade to a new Junction A. Another question. With the SM-EW67, can I go with the BM-DN100 and EW-WU101 and have Bluetooth, or does the SM-EW67 not support that? Thanks again!!! 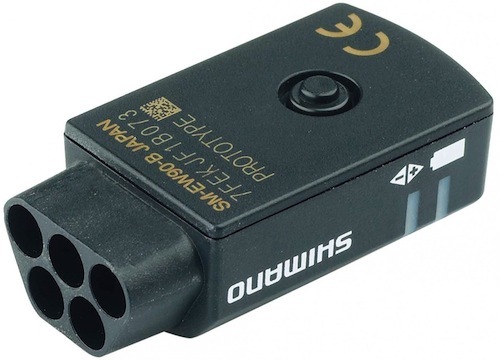 I think the problem with the SM-EW67 is that it can’t charge internal batteries, and that is why it is not “approved” for use with internal batteries. It should work with external batteries. I’m converting my ultegra 6800 tri bike to ultegra 8050 di2 and have a few questions. Does anyone know if the 8050 FD is compatible with a 6800 crankset? I’ve heard there are some slight differences. Also, is anyone able to explain what the EW-WU111 offers and is it essential? I’m about to order the parts, i’m leaving the wires out as i’ll get the bike shop to install it and get the right length at the time. I’m not sure for the crankset compatibility. Everything else looks good. The EW-WU111 is definitely not essential. It allows you to view gear and battery details on your Garmin (or similar) device via ANT/ANT+. It also allows you to change shift settings using an iOS or Android device connected over Bluetooth LE. In addition to the list of features Carlton listed for the EW-WU111, it can also be used to update the firmware on the components. In my case and assume this is true for all users, the EW-WU111 firmware can only be updated using the iOS or Android app. I have a rear derailleur adjustment problem. The system has 32 increments of lateral adjustment. On a typical setup you would expect the initial neutral installed position to be such that you would be somewhere near the middle of this range. Then you would have scope to adjust 15 or so increments either way – more than enough to accommodate tolerance variations when using different wheels. When the dealer supplied my bike he avoided pointing out to me that the neutral installed position was hard up against one side of the range, and I only found out much later when it was too late to do anything about it. Nothing to do with the wheel by the way. I’ve had the same problem with every wheel I’ve had in there. Maybe it was faulty from the get go? I don’t know and we’ve basically fallen out. The question is, is it possible to set this installed neutral position in some way? An adjustment screw? A trick of some sort? I’ve asked this question before but don’t think I got an answer, and I’m not optimistic I’ll get one now. If anybody has any insights I would be mighty grateful. Cheers all. Sounds like your frame is bent (manufacture or crash damage), hanger is bent, or the rear mech is twisted. Have the jockey wheels been removed or replaced with oversized ones? Since you state that this problem exists with every wheel you try, it would suggest that the issue is related to either the bike or the mech. Another thing to check is the condition of the frame, particularly the inside edge of the drop outs. If these are damaged, you will see movement of the rear mech when you clamp the skewer, which could be sufficient to cause misalignment. 1:/ Your dealer should have a Derailleur alignment tool. Ask the dealer to use this to check if your derailleur / hanger is out of alignment. If the hanger itself is bent, either replace it with a new one (always a good idea to have a spare one anyway !! ), or remove it from the bike before you try to straighten it. They are designed to break in the event of too much load. Also, you could break your frame with a little too much pressure (especially carbon). Once you have established that the frame and hanger are in line…..
2:/ Put the gear into 5th (straightest chain) and run a straight edge (e.g. a long ruler) along the cage towards the crank. It should be pretty much perfect. 3:/ Look at the jockey wheels. The top one should have a little bit of “float” movement (sideways play). The lower one should be fixed. It is very easy to get this wrong if the mech has been stripped for cleaning. 4:/ Slacken off both of the 2 screws holding the jockey wheels in the cage and carefully re-tighten. This will help to take out any twist-misalignment caused by assembly. 6:/ Check that the jockey wheels are parallel and in line with each other. The Jockey cage is quite easy to bend out of alignment. IF you strip the cage, one of the side plates comes off easily. (Do remove the mech before trying to straighten them). 5:/ Refit everything and set the micro adjust to mid range and have another go at adjustment, including hi-lo limits and B-screw. Your RD hanger is likly out of alignment. Thanks, but I don’t think that can be it. I should have said the derailleur has been on two different frames with the same problem. It occurs to me that if there were a washer between the derailleur and the hanger (should there be?) this would push the derailleur further out and might solve the problem. Any thoughts? Martin. A picture or two would be appreciated. Great article. Thanks a lot! 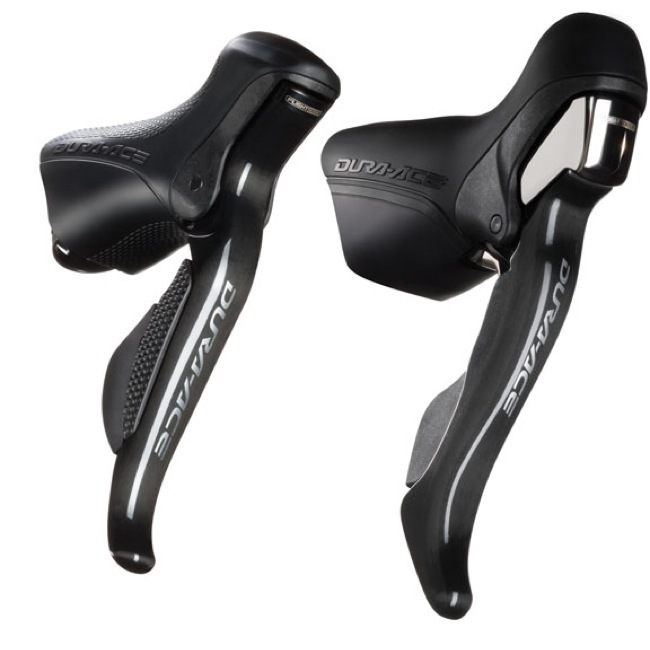 I have a Ultegra Di2 6870 set (Trek Emonda SL7 Disc) with a Profile Design T4+ aero bar, and I am shopping for an shifter extender. 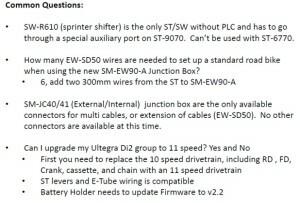 Does anyone know if the SW-R671 is compatible with the Ultegra Di2 6870 (11 speed)? If not, anyone has a recommendation for a shifter extender compatible with 6870 and the aero bar? Yes if you use the external battery. Awesome article, so much info. I have read through but can’t find anything on this so forgive me if I am repeating somebody. I have a TT bike with di2 and synchro shift enabled. I have the single button brake shifters and the single button extension shifters. I have full synchro enabled and it is currently on the default shift map setting. I am running a 36/52 front and 11-28 rear. What would be the optimal shift mapping setting for triathlon (hilly course). I had the same set up on a Cervelo P5 with single buttons and syncroshift working the rear mech on the buttons and the front mech automatically by synchro. I also installed a R600 climbing switch to the basebar so that I could force the front mech over quickly. (This did require a second junction B and another short cable, but worked very well. When the battery on my wife’s 2012 ultegra di2 10 speed dies can it be replaced with one of the newer seat tube versions? 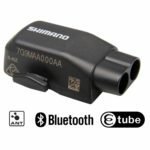 Shimano seem to have stopped making replacement batteries for the original di2 and I a man worried the whole system will become obsolete. It will depend on the rest of the Di2 components. 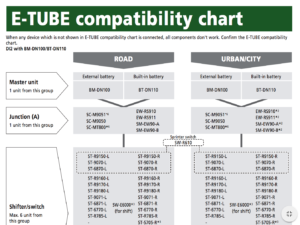 Shimano publishes a “Compatibility Matrix” which you can use to determine supported configurations. 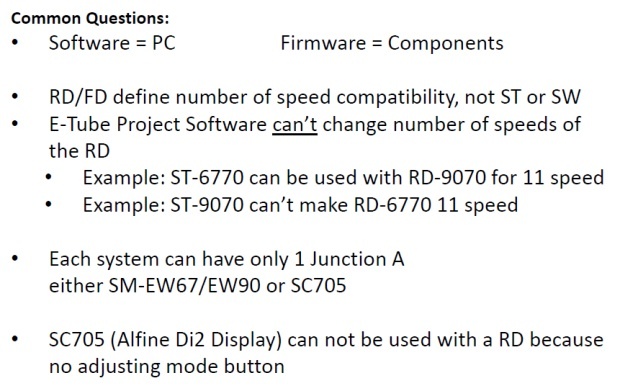 Firmware revisions may also impact compatability, the matrix will help here also. Try this link to the matrix. Howard, I have the original 10-speed Ultegra. All you need to do is install a new battery and update all the firmware. If you have the original EW67 Junction A, that may be replaced as well. Upgrading to 11 speed is a much more complicated and expensive ordeal that I think is very difficult to justify given limited advantage. I have just bought a new bike fitted with the latest version of Di2 Ultegra (R8000). 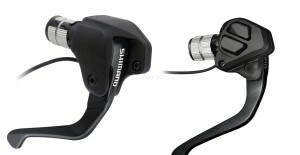 I am so far unable to pair the Di2 with either my Garmin (Edge 810) or link it to the E-Tube app. The lights on the Junction Box don’t flash when I press the button for 0.5 seconds as indicated in some instructions. However, a double press does make them flash which reading from earlier posts seems to indicate what synchro shift mode it’s in, which seems to suggest it’s got the latest firmware. 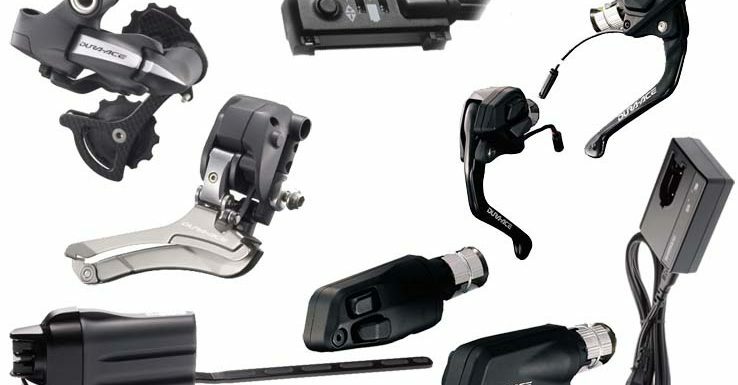 How to I pair with my devices – one of the reasons I went for a bike with the newer version of ultegra was the added functionality. Just checking, did you get a option of the EW-Wu111 wirless unit ? This does not come as standard. 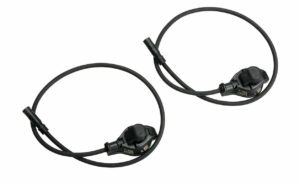 If you do not have one, you will have to get a short length of DI2 cable. No, there wasn’t an option. 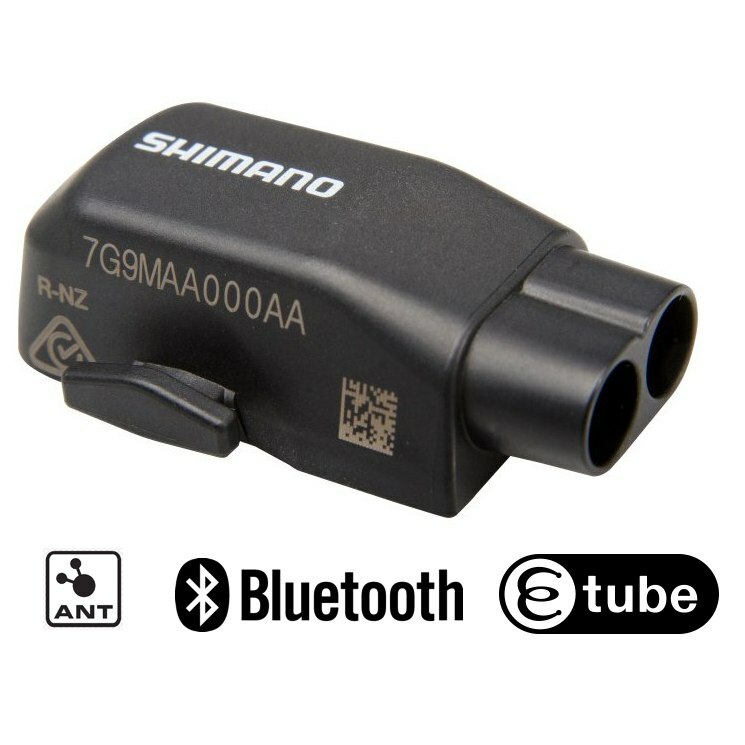 I’ve seen the wireless unit on the shimano website when looking for information and assumed it was included in the build for the new groupset. I’m guessing this isn’t the case?! The EW-WU111 is and add on and purchased separately. 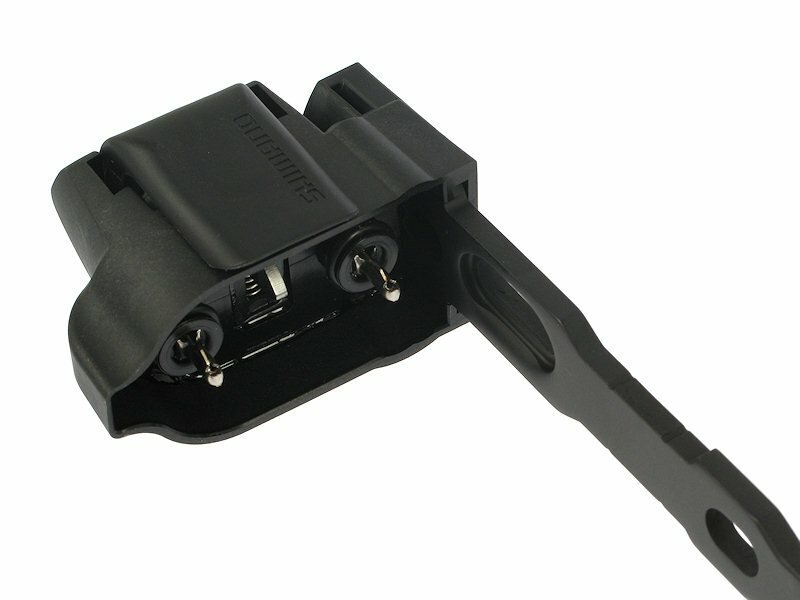 This is the magic piece that allows you to use the E-Tube App and connect to your Garmin 810. Assume your new build has an internal battery in the seat post. My EW-WU111 connects just below the battery with a short Di2 wire and I have had good performance. This may not work well with a metal frame. You will also need the DN-110 (internal or DM-110 (external) battery as you need the memory function. I have Di2 on my bike, set up for synchro shifting which it does fine BUT a bad bump on the road “bumps” the chain off the big ring onto the small ring with ensuing confusion to me and the set up. Any clues? I haven’t experienced this. Most likely, you have either a front derailleur alignment issue or a chain length issue. 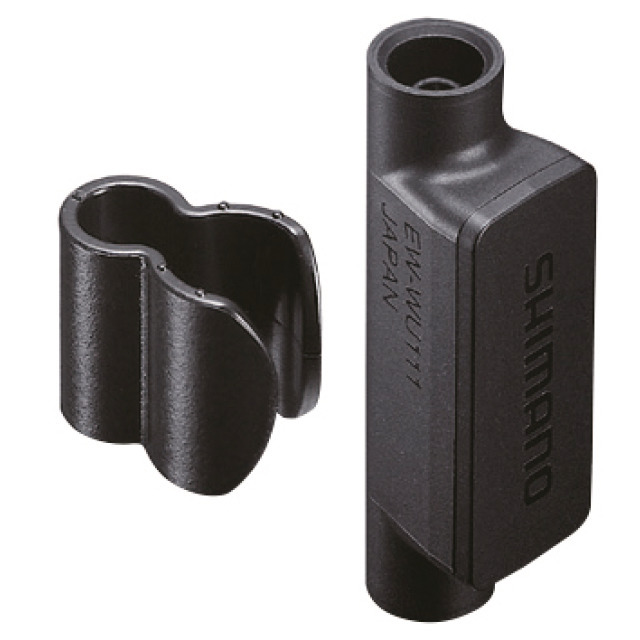 The Shimano dealer install manual goes though of all of the adjustment requirements for both. Thanks for your comments. I’ve taken a link out if the chain and rechecked the FD settings. The electronic setting as described in the manual doesn’t seem to function – never has so I wonder if that bit doesn’t apply to the latest software for synchro shifting. I’ll see how it all goes when I ride on Sunday. Thanks for your advice – always nice to know that someone will respond to these niggles. Try coming out of Snychro mode and do the micro adjustment on the front mech according to the manual. Thanks to both. I took out a link in the chain and as suggested fiddled with the FD in manual mode. Didn’t “bump” off the big ring today, so that’s a plus. Although, rather than bumping off the big ring I do find that occasionally the Fd moves over to drop the chain onto the small ring. Is this me? -I have carpel tunnel syndrome in my left hand and basically, after about 20 miles I have no feeling in my left hand at all – synchro shifting on the right lever helps an awful lot with this, but occasionally as I say, the FD moves over to the small ring. I’m thinking of bypassing the left lever in case its my left hand nudging the down shift lever. No problem with that just the pain of taking all the bar tape off. 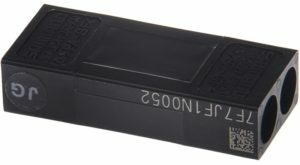 I need a female/female connector – is that EW-JC200? As a temporary measure I can pull back the bar tape at the lever, pull the two wires out of the lever and plug them into the connector. Sound OK? For the first part of your question. If the battery voltage drops below a certain value, say 6.3 volts, if the chain is on the outside chain ring, the FD will drop the chain on to the snall chain ring. You then will not be able to get it back up, untill you charge youur battery. The question is if after the chain goes to the small chain ring, have you tried to get it back up to the larage ring, If you have then it maybe you touching the switch. I have noticed if I hire a bike on hols, and it is mech, I do then to miss change gears for a few days after getting home, as well as tring to rip the shifters out of place. I have ultegra di2 with the old SM-EW67-A-E Ultegra 3-Cable Junction. I want to install TT bar end shifters. I notice there is a spare port on each of the st 6770 shifters. Can I simply plug the SW-R671 cables into these ports or do I have to buy a 5 port connector and new wires? Those ports only work with the climbing shifters. Ahh ok thank you. I take it I’ll need to buy a 5 port connector and 2 new wires for the existing shifters? Based on the latest E-Tube Compatibility chart, you should be able to upgrade to the BM-DN100. Here is the URL for the chart: http://e-tubeproject.shimano.com/pdf/en/HM-CC.3.2.0-01-EN.pdf. As for battery life, 3 years is pretty typical for almost anything electronic with rechargeable batteries. Great website..Lots of info..I’m new to bike mechanic’s and di2 components. Wife has Dimond bike with 9150 derailleurs, sm-bcr2 charger, sm-ew90B, not sure on battery model,but the build is pretty new. Problem is : the bike quit shifting, the battery makes a grunting noise about 6 or 7 times but the derailleurs dont shift, on the 5 port box the green led light comes on solid (i think means full charge?) but after a couple of seconds the led light next to the battery indicator light comes on red? Update, found where a small screw looked like it had backed out on the bottom derailleur and the rear derailleur was jammed up against the bottom of the bike frame. Tightened up that screw and now the derailleur cant hit the bike frame. But now even weirder both buttons on the right side of handle bars( bar end shifter and button by the brake both cause the rear derailleur to go down(smaller cog). Hallo, really usefull guide & info sheet. I would like to know how i can find out wich firmware i have at the moment? 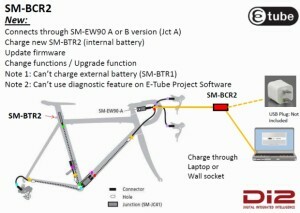 You will need to hook your bike up to the e-tube software to determine the current firmware. What model year is your bike? Have you ever upgraded the firmware? i have never upgraded firmware. bought this bike from conti team few years back. the bike is 2010-11 year. Have no idea if they upgraded firmware. I have a project whereby I wish to consider Di2, but cannot drill out the cable holes in the frame. These measure 4.2mm diameter for normal brake cable outer. Therefore I will need to cut the end off the E-tube cable and solder it back together once threaded through. Any issues i might experience, or tips? (external wiring is NOT an option. I cut one of my spare cables and added in the test ports for the use of a multimeter to record the voltage and current. It is just two standard core cable, no screening. Just cut, solder and tape up each core. But just before that, get some heat shrink (with glue) from an electrial wholesaler and put that on first. Allow it to overlap by about 10mm over the outer core on each side. I would buy a few sizes and try it out on cable of a similar size, because you can get the shrink that will shrink from a large size down to a small size, but you might find that it is too thick and might be ungainly afterwards. Try to make sure the heat shrink ends up no closer than 50mm from the push in plug. This will reduce a bit of tension. You can get coloured heat shrink if you really want to stand out. This is a easy job so give it a try, best of luck. 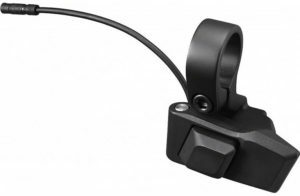 Thanks for the very useful article , i’m looking to buy a R8050 Di2 groupset , my frame don’t have any kind of internal mounting , so only option is to go with external battery “SM-BTR1” and external battery mount “BM-DN100” , i’m buying SM-EW90 Junction A with the group . Q1 . As per my understanding , BM-DN100 is enough for the syncro-shifting to work , even if i’m working with older model external battery “SM-BTR1” Am i correct ?? 2 – I’m not buying the wireless unit , i’m looking to the ability of customizing my group via e-tube pc app … Can i use SM-BCR2 charger with the “BT-DN100+SM-BTR1+SM-EW90 Setup” for charging battery through Junction A and connecting group to PC ? Hytham: Yes, you are correct on everything. – So to Confirm i’ll buy SM-BCR2 charger “And NOT SM-BCR1” plus the SM-BTR1 Battery plus BT-DN100 Mount and the SM-EW90-A Junction . But R8050 Guide shows that SM-BCR1 should be used for charging of SM-BTR1 , No where certify that SM-BCR2 can be used for charging of SM-BTR1 via SM-EW90-A Junction ..
I’m trying to buy one charger to cut cost . So to confirm i’m gonna buy SM-BTR1+BM-DN100+SM-EW90 And Use SM-BCR2 “NOT SM-BCR1” for BOTH charging and E-tube PC connection . 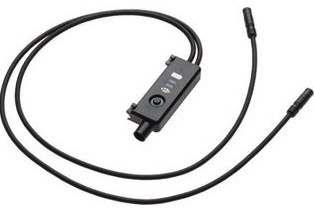 Problem is R8050 Product Guide and compatibility guide shows that BM-DN100 is compatible with SM-BCR2 for PC Connection but also mention that For charging of SM-BTR1 , SM-BCR1 should be used , I found no where certify that SM-BCR2 can be used to charge SM-BTR1 via EW90+BM-DN100 . 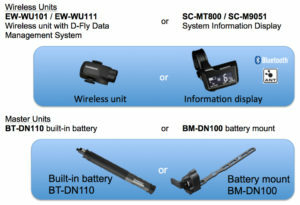 I’m trying to buy 1 charger for both functions “charging/PC Connection” ..
Sync shifting should work without FW upgrade “BM-DN100 should be up to date”, right ? As long as all components are on the same firmware revision, and that revision supports sync shifting, you should be fine. I don’t believe the PC adapter can charge external batteries. I think it only charges internal batteries. But I’m not positive about that. I have 6870 36/52 and 11/28. If i damage my RD-6870 GS in a fall, can /I upgrade to the new R8000 RD? 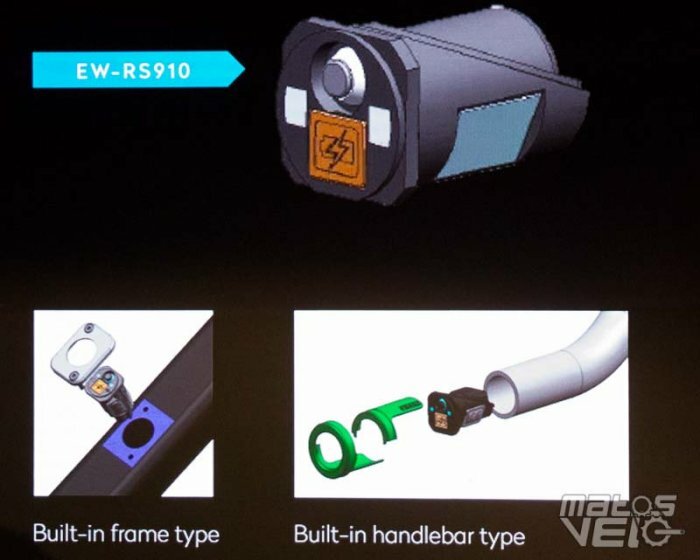 If I replace my front crank with a new R8000 one, would you be able to adjust the FD-6870 enough to work with this crank. If I have to change the front FD, will the 6870 shifters be OK? I thought the crankset for the R8000 had a 0.5mm difference in spacing between the two chain rings, this does not sound like much, but does are people able to adjust it out? Kevin – I’m running a 6800 crankset (52/36) with an r8050 RD and I’ve not noticed any issues so far. Hopefully there’s no nasty surprise waiting to jump out at me! My question is if you have a R8000 crankset and a FD6870, will they work ok and if a FC 6800 crackset work with a FD8000 di2 front derailleur. The reason is If I break some thing and the part is unavailable, that I have the option to use the R8000 parts on my 6870 system. 1- So to confirm i’m gonna buy SM-BTR1+BM-DN100+SM-EW90 And Use SM-BCR2 “NOT SM-BCR1” for BOTH charging and E-tube PC connection . 2- Sync shifting should work without FW upgrade “BM-DN100 should be up to date”, right ?